The purpose of a summary paragraph is to provide the reader with brief and concise information about a research article, short story, or even full book. You can also write summaries about academic journals and scholarly studies. A lot of students who lack experience with writing summary reports might feel intimidated at first, but with some practice and an understanding about the process, you will find that it’s really not a big deal. The first step for achieving this is to create an outline of the text being summarized. Next, write an introduction that hooks the reader. While you need to keep it short, it should still be informative. Highlight the main points from the next; use a yellow highlighter if necessary. Make a note of the essential phrases, keywords and (if it is a story) the main plot points. If you summarize an article, make a note of the thesis statement. As you begin outlining the summary report, think about the author’s intentions. What purpose does their work serve? Once you are able to determine the main ideas, between one and three examples that support them. For instance, for a short story, you could mention a quote, or for a scientific journal, you could discuss the important findings. Although you should do your best to express everything in your own words, there are times in which you might find the author’s explain to be the best way of expressing it. Likewise, there might be certain important key phrases or iconic expressions that simply cannot be rewritten without looking odd. Your introduction should mention the name of the author(s), the title of the work, and when it was published. You would also want to specify that it was a short story, book, or academic article. This will allow the reader to know what to expect. Use commanding language such as “contends” “argues” or “maintains.” Likewise, you can use “discusses” “illustrates” and “states.” Aside from making it clear that everything expressed is the author’s own ideas, this will allow the summary to flow much better, which means it will be easier to read. Discuss the main ideas of the work. Finish the first paragraph with the thesis or theme of the text. Use evidence from the text to support these ideas. Consider who, what, where, and why as you examine the information. When summarizing, define the setting. Finally, discuss the motivations of the author, in particular their aims. You should paraphrase as much as possible. In order to make the summary interesting to the reader, avoid repetitive language. Also keep in mind that this type of paper does not provide a platform for critiquing or otherwise offering an opinion about the work. 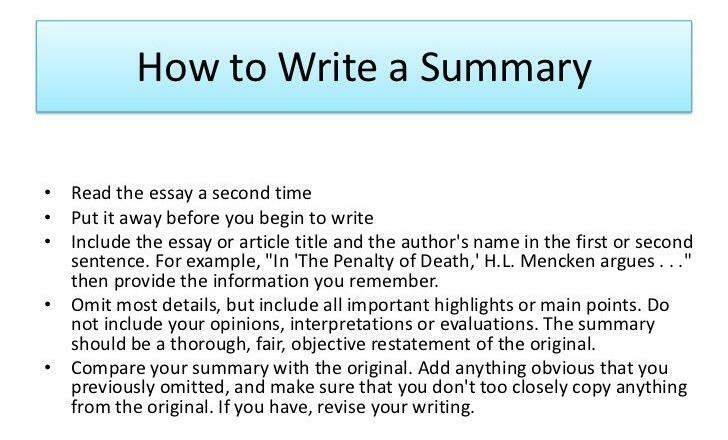 Each summary paragraph should be around six to eight sentences. Do not overlook the importance of editing and proofreading as even one little typo or an irrelevant sentence can make your paper look sloppy. Do you know how to write a good summary? Do you know how to write an objective summary? How to write a summary or how to write a summary paragraph? If you know how to do a summary or how to write a chapter summary, then you know that it involves briefly retelling a text using your own words. Common types of texts that are summarized include chapters of books, articles or entire novels. You can also summarize visual and audio mediums including movies, music and even lectures. The summary does not contain every minute detail nor is it intended to be an opinionated writing task. Instead, it is a good way for your professor or instructor to evaluate your ability to subjectively lay out what the author is stating. Writing a summary is a useful exercise because it requires you to be able to identify the main points of a text and rely them in an understandable way. Thus, it requires focus as well as good writing skills. As mentioned, it does not require you to interpret the text or try to understand its deeper meaning. You are also not trying to “sell” the story to the reader or otherwise explain why the story is worth their time. While each person might have their own idea about which plot elements are most important, in general the way one person summarizes a text should not differ that greatly from other person’s summary since you are not being asked to critique it. What is a summary? You should be able to define summary and define summarizing. So what is the definition of a summary? Read below the details. A good summary provides the reader with an outline of a larger text. It can be used to answer such questions as, “Who are the main characters?” “What do they do?” “Where does the story take place?” “When does it take place?” “What are the main ideas of the text?” “What scenes or quotations provide evidence of this?” Within the text of your paper, you should explicitly mention that you are writing a summary of the text. In your summary statement, mention the title, author and year the work was published and make sure to cite it properly according to your instructor’s preferred formatting style. Since the point of the summary is to be objective, you should not attempt to comment on what you liked and did not like, the emotions that were triggered as a result of reading the text, nor should you discuss how the story could be better, as you would if you were assigned a book review or reflection paper. Sometimes this can be difficult, especially if you are reading a text that you strongly disagree with. But remember that no matter how much you regard the work as flawed, your job is to simply report what the writer says, not what you believe he/she should say. Just like any good paper, you need to decide what information is important and what can be omitted. The key plot lines and character arcs are obviously going to be necessary, but the little details that are inconsequential can be left out. You also do not want to include anything that is not relevant to the text. When your instructor asks you to reach a certain page or word limit, it is because they want you to find a way to explain yourself within those restrictions. Reaching the word requirements does not automatically mean you have written a good paper. As you identify the main ideas of the text, make sure to devote an entire paragraph to each of them, and include any evidence from the story that will demonstrate this. You will not include a conclusion in the traditional essay sense (in other words, you will not reflect on the broader implications of the story or explain how the author makes an impact). Instead, you will end the summary by noting how the story resolves itself or what the researcher states after having reached their conclusions. As you summarize, you should avoid copying and pasting entire paragraphs of text. Remember that the point of this exercise is not to reach your word requirements by any means possible, but instead to demonstrate that you understand the story. You can use quotations, especially if the author expresses something extremely well, but only in moderation and only if you have a compelling reason to do so. How Long Should a Summary Be? How long should a summary be? It depends on your instructors requirements, but as a rule, your paragraphs should not exceed eight sentences each. As you are reading the text that you need to summary, underline all of the main points as well as any supporting evidence. If you are summarizing an academic work, you should look for the topic sentences that start each of the body paragraphs. If you notice a particular word popping up several times, it is a good sign that it is important to the topic of the paper and therefore should be mentioned. Use transitional words and phrases when you want to understand how all of the work is arranged as a whole. When summarizing academic articles, note that the thesis will always be written near the end of the introduction. Each of the main points of the body will link directly back to this thesis. Do some brainstorming. Make a list that includes the main ideas of the story, the essential supporting details, and whatever you can present for each. For sophisticated pieces with key words, it is acceptable to include them in the summary. But as always, avoid expressing too much detail and don’t use repetition. Your summary should be written in chronological order, stating that happened first, second, etc. For academic papers, start by summarizing the conclusions and then move on to summarize the body paragraphs. You might also need to summarize the findings and results, depending on what type of paper you are summarizing. Naturally, as you conclude a research paper, summarize the paper’s actual conclusions. You are one-step closer to being able to write a summary yourself! Just make sure to keep the paper informative without filling it up with too many details. Start by creating a somewhat comprehensive outline and then eliminating the unnecessary information. Use the outline as a guide for your entire summary paper. If you are still asking yourself, “How long is a summary?” you should consult your professor or instructor. How many sentences are in a summary? This can vary, but generally, each should be between six and eight sentences. So what does summary mean? At this point, you should know how to summarize an article, how to summarize a book, how to summarize a story, and how to summarize an essay. This is a good way to process important information from the text. As you read it, take notes and be aware of the most important points. A good way to test your ability to summarize is to try to remember all of the main points without having to refer back to the text. To him in this, you should list these points and say them outline so that you can commit them to your memory. Also keep in mind that editing and revising is extremely important. After all, if the reader is able to detect mistakes, it will be a big distraction and your writing ability will be called into question. Do not check for punctuation, grammar, spelling or proper structure right away though. When you finish the summary, let it sit overnight and take a look at it again the next day. With a fresh set of eyes, you might notice some mistakes or flaws that you were not aware of when you were deep into the writing. Reread at the sentence, paragraph and full paper level in order to ensure that the paper is cohesive and understandable. If the author of the work is writing a subjective paper such as an argumentative essay, remember that the purpose of your summary essay is not to agree with the author or highlight their evidence as a way of proving them right. Instead, as you list their evidence you would merely contend that they author uses this evidence to support their thesis, not to pass judgment on whether you believe their arguments. For this reason, you would use statements such as, “The author argues…” or the “author contends…” This reminds the reader that you are merely discussing their statements without injecting your own arguments or conclusions. Finally, remember that as you read, focus on the most important points and include the author’s evidence. While you should do your best to write the summary using your words, there are times when using keywords or technical expressions is your only option, especially if there are no real alternative ways to press something. Now that you have read this comprehensive guide to writing a summary paper, you are well on your way to success. You should now understand what a summary entails, strategies for uncovering the most important points, and the things to avoid, such as turning the paper into an opinion piece or including irrelevant information just for the sake of filling up the paper. As always, if you are not clear about the expectations of the assignment, make sure to discuss this with your professor or instructor so that you do not go into the summary essay with misunderstandings.